Tree trimming is a specialized service with trained employees who are very skilled at their task. A question that is on a lot of homeowner’s minds is do you tip tree trimmers? Tipping is a custom that we normally associate with waiters and other service-oriented occupations such as valets, barbers, and bartenders. However, for many other specialty services, such as cashiers, dentists, or auto mechanics it is not customary to tip. The habit of tipping is predominantly an American phenomenon but practiced in some other Western countries as well. The expected tip in the U.S. is usually between 15-20%, which is on the highest end of the scale. Who made up these rules? I’m not sure, but one theory is that we tend to tip in places where we are having fun and the server (presumably) isn’t. 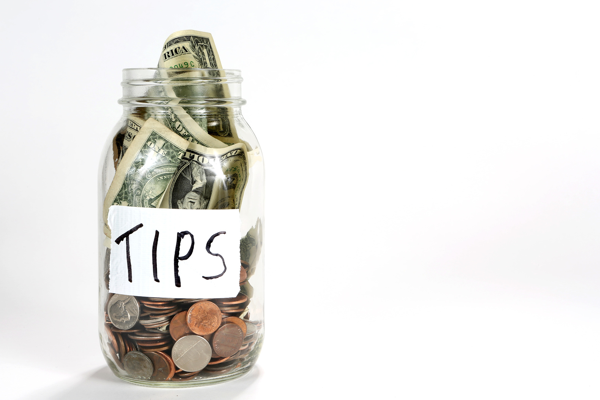 Tipping is a way of saying “thank you” or rewarding good service as well as alleviating social guilt. In the hospitality industry, a tip is usually also a supplement to a low hourly wage; it doesn’t matter if you work at Applebee’s or Spago, the restaurant likely pays you the same base rate. So where do the service of tree trimming fall (pun intended) – do you tip tree trimmers? Generally speaking, tree trimmers, like waiters, are usually paid hourly or by the job. The job is very labor intensive and far from glamorous, but I suspect most tree trimmers enjoy their work (that’s been my experience, anyway). Your tree trimmers also most likely make more money hourly than, say, a valet. As far as social norms go, it is not customary to tip your tree trimmers; when you receive your invoice and pay with a credit card, there is not a line to place a gratuity. A tree trimmer is not standing there expectedly palm outstretched, and would quite likely be very surprised if were you to offer them some extra money. However, does this mean you shouldn’t tip your tree trimmers? Of course not! My feeling is you could tip your tree trimmers if a) they go out of their way to help you with an extra task b) the job seems to be harder than anticipated, like a stubborn tree trunk or c) you felt they did an exceptional job like cleaning up not only the tree mess but maybe some other foliage you had. And while an emergency tree removal in the middle of a cold, rainy night already has built-in extra fees, a tip for a job safely and quickly done would certainly be appreciated. Again, this is just opinion/suggestion. I know budgets are tight for many customers and tree trimming costs are not cheap. If you would like to offer your tree trimmers some type of reward, consider buying/preparing lunch, giving them some kind of snack, or simply offering them a glass of water. A sincere “thank you” is always appreciated. « Can I Make My Neighbor Trim Their Trees?